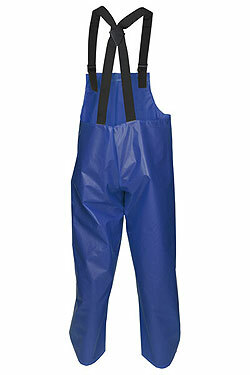 The 563BF is a bib style pant with plain front and take up snaps on the ankles. The full elastic adjustable X-Back suspenders are comfortable, easy to wear, and fasten securely on the front with snap lock buckles. This TPU/Nylon material is light in weight, durable, and strong for outstanding wear. The TPU outer makes this a great option for food processing applications and is resistant to many oils, fats, and greases. Ankle take-up snaps and buckle snaps are durable and metal detectable.